The Fitzpatrick Company, well known supplier of the FitzMill Comminutor for over 70 years, is now introducing the Fitz-cM Classifier Mill. 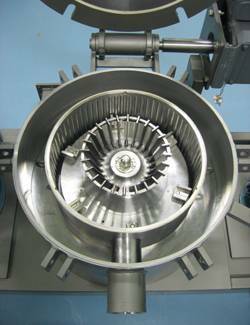 Fitzpatrick brings their background of supplying high quality precision process equipment to Classifier Mill Technology. 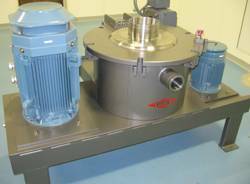 Fitzpatrick’s background in the Chemical, Food, Mineral and Pharma industries has been applied to this equipment for a rugged yet sanitary and cleanable design. The Fitz cM Classifier Mills are designed to provide size reduction with integrated classifier to insure the desired product is achieved. The mill operating principle is mechanical impact size reduction which minimizes the operating energy costs. The internal air flow then leads the material to the integrated air classifier to separate the desired product from the material that is still too large. The Classifier operating principles balance centrifugal force and drag force to generate a high precision method of classifying particles according to size and density. The oversize particles are then automatically returned to the milling chamber until they are reduced to the desired size. By adjusting the milling and classifier parameters, the system can be set up to achieve a wide range of size reduction objectives, from 97% below 150 microns to 97% below 10 micron. Units up to 75 HP feature a double walled main housing, which greatly reduces noise break out and ensures product contact parts are easily removed for cleaning. Bearing housings feature co-axial drive shafts, to enable the mill rotor and classifier wheel to be independently driven and the speed of each varied to optimize the system for each application. Cooling is available for the bearings, in addition to air purging if required. Fitzpatrick offers complete engineering for systems that are customized for specific applications. Fitzpatrick also offers a service team for equipment training and process optimization. Let Fitzpatrick put its many years of Size Reduction experience to work for you.